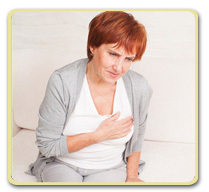 As with men, women’s most common heart attack symptom is chest pain or discomfort. But instead of the classic chest discomfort women are somewhat more likely than men to experience certain “atypical” symptoms, particularly shortness of breath, nausea/vomiting, and back or jaw pain. An important distinguishing feature of coronary heart disease is that the discomfort often occurs with exertion or activity. To confound things, however, heart attack as well as heartburn may occur after eating. With severe chest pain, atypical symptoms suggestive of heart disease, or if chest pain is a new occurrence, it is best to leave the determination of the cause to the physician. If you have warning signs of a heart attack, do not try to decide for yourself what the problem is—seek immediate medical attention. A heart attack is an emergency. Call 9-1-1 if you think you (or someone else) may be having a heart attack. Prompt treatment of a heart attack can help prevent or limit lasting damage to the heart and can prevent sudden death. Remember that although both conditions make reference to the “heart”, one is primarily a painful nuisance whereas the other represents a true medical emergency. If you have any questions about the differences in heartburn and heart attacks, please log into your account and send us your question. We are here to help.